Henry Jessey (1601-1663) rose to prominence as pastor of the “Jacob-Lathrop-Jessey church” in Southwark in the early seventeenth-century London during the time when Baptists in England were undergoing their initial formalization. Jessey never married, wrote extensively, played key roles in the English Civil War, and served the early history of the English Particular Baptist movement, which would grow to shape Baptists around the world. Giveaway ends June 21, 2017. Finally, Henry Jessey gets the scholarly attention he so richly deserves. This very significant figure in the history of England and the beginnings of the Baptist movement has languished in obscurity for too long. In this new book, historian Jason Duesing brings Jessey to life and this book will make a great contribution to the fields of Baptist history, intellectual history, and the history of Britain. This book is solid scholarship matched to good timing. It belongs in every academic library and in the hands of a multitude of grateful readers. God’s faithful servants must not be forgotten and assigned to the dustbin of history. Thankfully, that will not happen to Henry Jessey as a result of this superb work by Jason Duesing. Informative, interesting and inspiring, this is a really fine work I gladly recommend. acquaint yourself with a significant figure in Baptist life, and to reacquaint yourself with a significant portion of Baptist history. Jason Duesing has given us here a superb treatment of Henry Jessey, a seminal figure in the development of the Baptist cause in seventeenth-century England. Well researched and well written, this book shows us what made Jessey tick as well as what he thought, from ecclesiology to eschatology. Highly recommended! 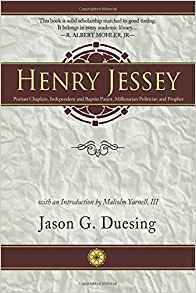 Jason Duesing’s “Henry Jessey” is a theological biography of no small consequence. .Jessey, the patriarch of the Particular Baptist movement, was a Baptist pastor, millenarian prophet, and politician whose significance Duesing draws out as he views developments in 17th century British ecclesiology and eschatology. Highly recommended for theologians and historians, especially Baptist ones. Jason Duesing’s Henry Jessey deserves a prominent place within the theological genre of biography established by such masterpieces as Peter Brown’s Augustine of Hippo, Roland Bainton’s Here I Stand, and Diarmaid MacCulloch’s Thomas Cranmer. This is a valuable text for a worthy life.